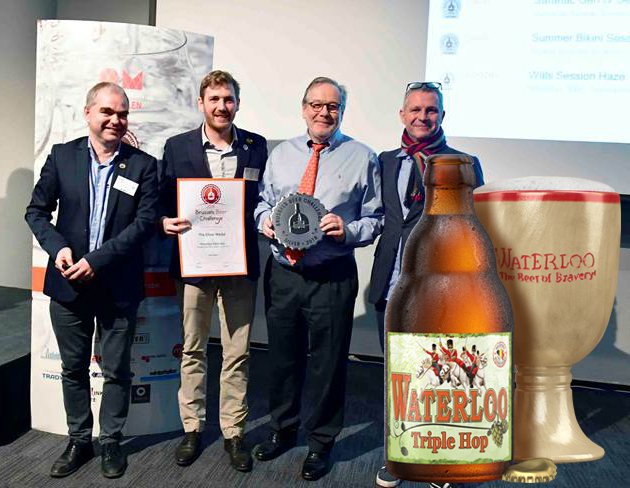 We are proud that our new beer Waterloo Triple Hop received a silver medal from the Brussel Beer Challenge. This top-fermented beer has a light amber colour and is brewed with three different types of hops. The Magnum variety provides bitterness during the brewing process, while the Cascade and Citra varieties give off their aromas during the dry-hopping process. Thanks to Brussels Beer Challenge 2018 for that recognition. Think about it, our brewery Ferme de Mont Saint Jean (where Waterloo is brewed) is open to visitors! Previous article 5 medals at the World Beer Awards 2018 Edition ! Next article Jonathan Martin was appointed "Chevalier de Droit de la Jeune Chevalerie du Fourquet des Brasseurs"